In ANOTHER all-Czech first rounder, the number eight seed and Nottingham champion, Karolina Pliskova, takes on Barbora Strycova at the Aegon Classic in Birmingham. The four Czech players, who all like the grass, have had a seriously rough deal with this draw. Pliskova heads into Birmingham where she is defending finals points with a nice injection of confidence. In what has been a wild year up till now, Pliskova enjoyed her best week of 2016, winning the title in Nottingham. The Czech player dropped her opening set of the tournament to Anastasija Sevastova, but powered through the next ten to claim her first title on grass. Pliskova held off a stern fight from Alison Riske in a superb final, 7-6(8) 7-5. It was the second match of the tournament for Pliskova where she had saved set points in both sets to win in two (having previously saved a total of four set points against Ashleigh Barty in the quarter-finals). Against Riske, Pliskova saved six set points in the first set and one in the second set on a tremendous rally. Pliskova was clutch on the big points and her serve got her out of trouble on so many occasions. She was wincing with the leg which was heavily strapped up but on the whole, played another great match. A word for Alison… I love watching her play on grass! She did so well to get Pliskova on the move, but just couldn’t convert on her opportunities. Strycova is having a great 2016 season; like last year, she started strongly down under, reaching the last 16 at the Australian Open. This time last year her good form petered out but in 2016, she has sustained it and managed to peak for the tournaments that really count. At the French Open, she won her first singles match since 2005 and reached the third round, winning her first ever set against Agnieszka Radwanska in an entertaining affair. While Strycova suffered a first round exit at Wimbledon last year, she was unlucky to draw Sloane Stephens in the first round. This is a surface that suits her game and allows her to show off her prowess at the net. 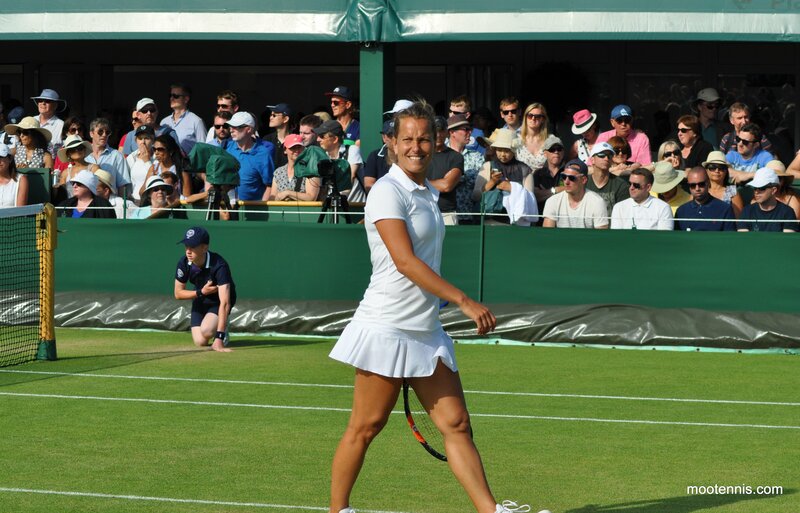 As a former Wimbledon quarter-finalist, Strycova will no doubt be aiming for a much better grass court season this year. Head-to-head record: In their only previous match, Pliskova defeated Strycova in Dubai last year, 6-4 6-2. Interesting stat (s): Pliskova and Strycova were the two runner-ups in the last two editions for the Aegon Classic in Birmingham. For Strycova, she has won at least one match at 10 out of her 12 singles tournaments in 2016, highlighting the remarkable consistency she has managed to produce this year. Final thoughts: This is my highlight of the first round matches and it’s tough to see which way it goes. Pliskova has really picked up her form on grass and the serve was dynamite in Nottingham, always coming to her rescue when in trouble. Pliskova though has had a taxing week in Nottingham with three matches over the weekend (all in straight sets but two of them were tough) and seemed to have a leg injury, perhaps picked up from the transition from clay to grass. It doesn’t look serious but enough to cause some issues based on the amount of tennis she has played in a short space of time. I think the winner of this match is going to go deep in this draw… while I would have gone for Pliskova based on how well she served in Nottingham and also, defended (!) I think the leg might be an issue. While Strycova is playing her first match of the year on this surface, she’s a tactically astute player on grass and if she maintains her focus (she’s been doing it much better this year!) then i’d fancy Strycova to come through for the win.